Comprehensive sheet; unique subjects; outstanding support material; full markings sufficient for two full aircraft; stencil markings a'plenty. Top quality decals, colourful and good value for money. 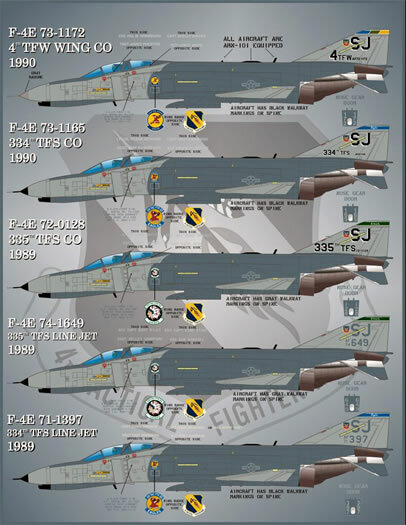 Amongst the latest flurry of releases from Afterburner Decals are two sheets covering the Mc Donnell Douglas F-4E Phantom in service with the 4th Tactical Fighter Wing (TFW) based at the Seymour Johnson Air Force Base, North Carolina in the late ‘80s and early 90’s. These two sheets are a step back in time for the guys at Afterburner Decals as to date; they have concentrated on contemporary machines flown by the United States military. I’d be pretty confident in stating that there are many out there who are fans of the Phantom and they will welcome these two sheets because, as everyone knows, you can never have too many Phantom decal sheets! 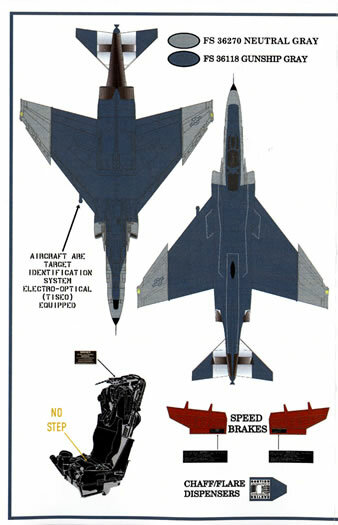 This sheet provides markings for five late-block F-4Es finished in the “Hill One” paint scheme of Federal Standard 36270 neutral grey over Federal Standard 36118 gunship grey and are equipped with the ARN-101 navigation, weapon delivery, and sensor management system - the black antennae on the spine (this system provides all-weather navigation and weapon delivery capabilities) as well as TISEO Target Identification System, Electro-Optical system (the cylindrical fairing on the leading edge of the port wing). F-4E, serial number 73-1172. This was the Wing’s Commanding Officer’s aircraft from 1990 and it wears 334th Tactical Fighter Squadron (TFS) shield on its port intake, a 4th Tactical Fighter Wing shield on its starboard intake as well as SJ white shadowed black unit designators and 4th Tactical Fighter Squadron titles and Tactical Air Command shields on its vertical stabilizer. The only other ccolour on the airframe is a chord-wise “wing band” on the top of the vertical stabilizer. Air and ground crew names are included for the canopy rails for this and all the other options on the sheet. F-4E, serial number 73-1165. The Commanding Officer of the 334th TFW’s aircraft from 1990. This machine is in basically the same markings as the previous option with the exception of a different style squadron shield on the port intake and 334th titles in place of 4th TFW titles and a white edged blue chord wise squadron band on the vertical stabilizer with a white Eagles title in its centre. F-4E-53 serial number 72-0128. This was the 335 TFS Commanding Officers’ aircraft in 1989. More of the same with a 335 TFS shield on the port intake and 335th TFS titles and a chord-wise white edged green band on the vertical stabilizer with a white Chiefs title in its centre. F-4E serial number 74-1649. This was a 335 TFS “line jet” from 1989. Markings are essentially the same but the unit designator is plain grey without shadowing. Whilst just a line bird, it still wears the full colour 335th TFS, 4th TFW and TAC shields as well as the white edged green squadron band. F-4E serial number 71-1397. A 334th TFS line bird from 1989. It wears the same markings as the previous option with the 334th shield and white edged green band replacing the appropriate markings. 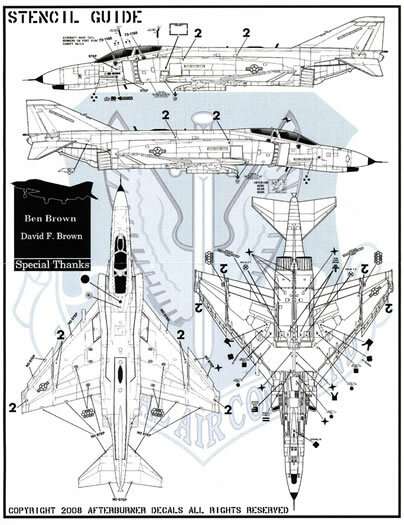 The placement guides are the standard excellent fare that Afterburner Decals present with all of their sheets. 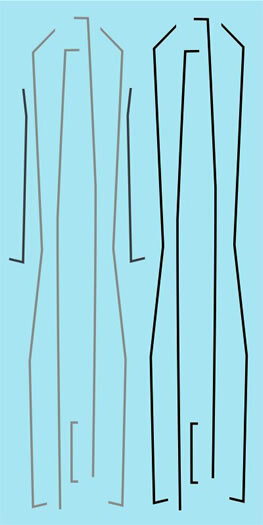 Two A-4 sized sheets are provided that show full colour left hand side profiles of each option as well as a generic upper and lower plan view. The other sheet shows large left and right hand side profiles as well as upper and lower surface line drawings to show the placement of stencil data. The decals themselves are printed by Cartograf. Everything is in perfect register, even the tiny lettering of the squadron and TAC shields. Stencil data is plentiful too with two sets being provided including slime lights, large 0 to 9 numerals in dark grey, four sets of smaller numerals in dark grey and two sets of light grey numerals. The former numerals are in the block stencil style whilst the latter are in a rounded style font. Stencil data is provided for the ejection sets too. A set black and a set of grey spine walkways are also provided as are two sets of grey wing walkways. The spine walkways are provided as five part decals and will require patience to align correctly. The placement guide and the two decal sheets (the main one holding all but the spine walkways) and the smaller one with the spine walkways come packed in a clear plastic zip-loc bag. 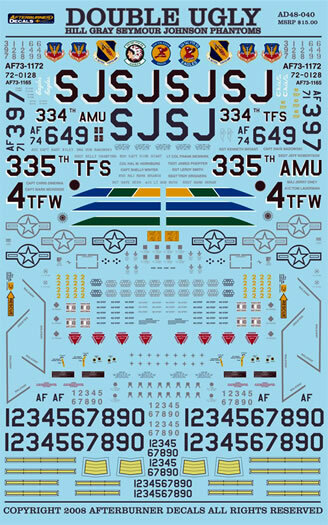 The placement guide advises that the decals are sized to fit the Hasegawa 1/48 F-4E kit but be aware that you need to get the version with the wing slats. You will also need to scratch build the ARN-101 antennae too but if my memory serves me correctly, the TISEO is included in the box. Sufficient markings are provided to enable you to model any two options from the sheet. 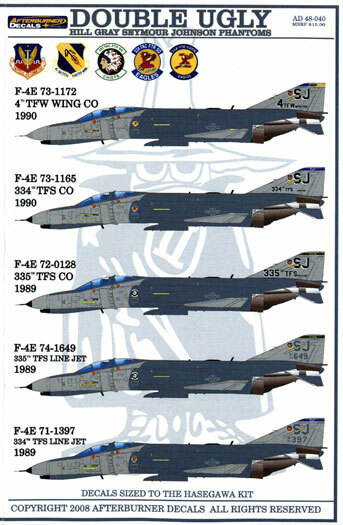 In summary, a nice set of markings for the F4-E in its final years of service backed up by first rate support material.